Though the actual negotiators are presumably busy assembling their new Christmas presents—I spent two hours yesterday getting a new wireless printer to work (see note*)—some of us are still arguing about various facets of the fiscal cliff, in particular, the chained-CPI (details as to what this is about and CBPP’s view here). 3)–OK, you want to index Social Security benefits to a more accurate price index? Then have the BLS develop a chained index for the elderly (in fact, they have the makings of one—the CPI-E—but it needs work). Dean Baker makes that case—forcefully—today. 4)–Do not make this switch. It’s a benefit cut to Social Security which is a critical source of income to most elderly. How could we possibly countenance such a change at a time when most of the economy’s growth is accruing to the wealthy as middle and poor families fall further behind? Bob Kuttner hammered this point home on this radio show the other day. But a) all the commonly used price indexes use average costs and are thus “skewed” up and down when the underlying distribution is uneven, and b) there’s little question that the ‘old’ elderly—the ones most hurt by the switch to the chain-weighted measure—face high out-of-pocket medical costs. Marcus goes on to endorse, as do we at CBPP, bullet #2, and this is clearly the administration’s view as well—in fact, they’ve built in offsetting benefits to the poor, old elderly into their plan. That’s very important and salutary and one reason why I nervously support the switch. But I’m more concerned than Ruth appears to be with the possibility that the current politics get us the chained CPI without the necessary protections. I’ve been in lots of debates with bullet #1 advocates who make the logical case that if it’s a more accurate index, then how can I argue that there should be some benefit adjustments or that it shouldn’t apply to SSI, the poverty line, food stamps, etc.? The answer is that I want to protect low-income families, who very much depend of these benefits, from cuts in the spirit of Kuttner’s arguments cited above (they’ve claimed virtually none of the growth in recent years). I am also convinced that the switch to the chained CPI is coming and we should make sure to make it when we can get something back for it, like the low-income protections we’ve argued for at CBPP. But this is no slam dunk and it is a development that must be closely monitored. As things stand, the current small-bore compromise on the table doesn’t mentioned the chained CPI, but it will be back next year for sure. *Note: A few things re this new HP printer. First, as noted, it’s wireless and it prints, copies, and scans and it cost $99. Pretty unbelievable, as long as we’re talking about price changes. The CPI does try to capture such quality improvements by making “hedonic” adjustments—look it up—which is one reason you see the large price declines for “personal computers and peripheral equipment” compared to the overall price index in the figure below. Second, while it was impossible to figure out how to work it, and it came with virtually no instructions, I went on HP’s online chat site, and with no waiting and the help of a very patient and smart techie, got everything up and running. So there’s one happy holiday story for you. Share the post "In Case You Were Dying For More Polemics On the Chained CPI…Here Ya Go:"
22 comments in reply to "In Case You Were Dying For More Polemics On the Chained CPI…Here Ya Go:"
So you do know that the HP model is basically a classic Gillette? Take a loss on the printer and make it up on ink sales. Can any CPI measurement adequately capture how that affects the “real costs” to a Social Security recipient? Over the past generation, most of the inflation suppresion has been due to the Walmart-ification of America. There’s a lot of meaning there. But at least part of it has been changing the basic product quality and durability while keeping the brand name the same. Do any of the CPIs capture product quality changes? CPI-E appear to grow around 0.3%/year faster than CPI-W. In other words, we’re likely not keeping up with the elderly’s cost of living. Therefore, if we wanted to be more accurate, we’d switch to CPI-E, as you say. If we wanted to stay close and keep it simple, we’d do nothing. If we wanted do decrease accuracy we’d move to chained CPI-W. Interesting which alternative is being pushed by the Washington villagers and Social Security haters, often in the name of accuracy. They are Social Security recipient haters, not just Social Security haters. No sane individual does this to the weakest among us. These are clones of Amelek. On the HP… just wait until you have to buy ink/toner! All of the printer manufacturers have gone to the razor/razor blade model. You pay less for the printer, but more, often much more for the supplies. Gotta figure these things out on a cost per page basis. An employee of HP once told me – “We’re not in the printer business, we’re in the ink business”. 🙂 Cost comparisons for printers need to be made with info on cost of replacement ink or toner, and the number of pages a replacement cartridge is expected to give. Once you know the price per page, you can more effectively price comparison. Do you argue that the chained CPI is unfair to “very poor” folks, but not to “nearly poor” elderly folks? It is either a fair measure of inflation or not! If we have to subsidize the poorest folks at the expense of the less poor (remember, the rich have nearly nothing to lose in this argument), then we are changing yet something else into a welfare program, one that tends to humiliate the recipient by establishing a lower class of beneficiary, and punishes the harder workers (also relatively poor), who have to subsidize what should be a welfare program. It is alarming that many in the middle class (and their President) endorse changes (chained CPI) that remove the financial burden of helping the poor from the responsibility of the rich, and place it completely onto the shoulders of workers (almost all earning less than $100,000), who have saved decades to have a small Soc Sec pension. That benefit percentage here for middle class workers is about 60% of that earned in other developed countries. The 1983 Ron/Tip agreement extended retirement age well beyond most developed countries to 67 and lowered benefits substantially for the middle class that had contributed the most to the system. That benefit cut, among other things, was to subsidize Soc Sec disability programs – benefits which many would argue belong in the arena of general welfare, paid for by general funds, including taxes from the wealthy. The folks who do not want to see anyone mildly enjoy their retirement are always rich, don’t need the money and don’t care how miserable the results of their number, number, number mentality used to solve public issues. (iii) the change is potentially reversable if it starts to have significant adverse affect. (iv) reversing the change might be a decent issue for the D’s in a future campaign. The assumption is that seniors’ expenses change and are generally lower than others when the reverse is more likely the case. The only exception to this assumption recognized by economists and cynical politicians are medical costs, which they admit are higher. Seniors are viewed almost as aliens that somehow morph into subhumans who simply don’t have the same needs as younger people. Well let me tell you: Senior housing costs – utilities, maintenance, or rent – go up and down just like real people’s housing costs. Unless of course, seniors need home care, assisted living, or nursing home care in which case housing costs skyrocket. Seniors’ transportation costs go up and down like everyone’s transportation costs. Unless, of course, seniors can no longer drive themselves or take public transportation, in which case someone has to do it for them and frequently that someone expects to be paid. Seniors’ food costs go up and down like everyone’s food costs. If the chained cpi is a more accurate tool, then use it for everyone. If seniors are supposed to substitute for cheaper good, than everyone should be expected to substitute cheaper goods. Let CoL adjustments fall for everyone or no one. My understanding is that the chained-CPI is a cut in all federal programs, disability, food stamps, veterans benefits, etc. It’s also a tax increase. It’s a tax increase that’s going to hit the under $100,000 filers harder than others. I can support a well designed, transparent, progressive increase, but this plan is hard to swallow. Can you tell me why we need this change now? In an era where defined benefit pensions have gone the way of the dodo, and our experiment with defined contribution pensions has hardly been a roaring success, do we want to make publicly supported pensions less generous? If the chained cpi is the true cost of living measure, then it should be used to adjust the colas for all men and women, working or disabled or retired or whatever, not just old people. If I had wanted to starve old ladies to keep taxes low on Mitt Romney, I would have voted for Mitt Romney. Maybe I will vote for the Romney next time. Because voting for the “anti-Mitt Romney” I was sold this time didn’t work out, just like voting for “the prosecute the Bushes, prosecute the banks, end the wars, close Gitmo,enact single-payer healthcare, ala carte cable tv” president didn’t work out last time. Right on, brother or sister! I wonder how the feds figure out product substitution. Marcus glibly writes that when beef goes up, she eats more chicken, and so on. That’s real simple BS. Beef would have to go up significantly before most people would make a conscious shift. Consumers may shift buying patterns if prices spike 7 to 10 percent. But if prices creep up 2 percent at a time, how many people start substituting something cheaper? I’ve never seen any stats on how many people would shift buying patterns at what points and for what products. At this point, any Social Security cuts are simply gratuitous since the program is not part of the trillion dollar deficit. As I understand it they use surveys to find the substitution effects. The Bureau of Labor Statistics evidently has a web page that explains it in great detail; I haven’t read it. The CPI is not really a price index anymore. The hedonic adjustments are somewhat justifiable … As long as the consumer accepts the quality improvements as something they want to have. 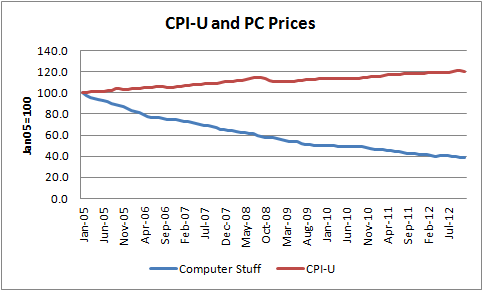 The deflation that is apparent in computer prices is mostly a function of getting (a lot) more computer per dollar, and not so much because average prices paid are that much lower than 20 years ago. The price per pixel of a flat screen TV is much lower than 1, 3, and 10 years ago … But how many people do you know that forked over $1000 for an “idiot box” a generation ago? Assuming that consumers will actively switch to cheaper substitutes when their preferred goods and services have become more expensive underscores the difference between the CPI (which should already be known simply as a “cost of living index” and not a price index, because it requires a consumer to be actively involved in seeking more goods and services for her dollar) and the chained CPI, which apparently allows substitution at a higher level than before. Currently, it is assumed that if one type of Apples has risen in price, the consumer would substitute something that hadn’t risen as much. The new index apparently assumes that consumers would switch between beef and chicken in order to maximize his purchasing power. Clearly, a consumer can benefit from enlightened substitution and seeking to maximize her utility, but shouldn’t the savings relative to a fixed basket be properly recognized as a payment for the time and resourcefulness needed to do so? How much substitution is acceptable, and where does one draw the line? Seems to me you could have decades of low inflation if more and more substitution is allowed. Is a Harvard MBA worth more than one from Wharton? If the former raises the price more than the latter, would you switch? Also, the “quality” (hedonic) adjustments seem to be almost entirely to recognize more value and thus less inflation. But many items today seem to be less sturdily made, even if the features may compare favorably with legacy products. If BLS focuses only on features of new production and not durability, we may be underestimating inflation. Hey Jared, we’ve already had one big such change in Soc sec, and you can see it in the data. Plot an index of avg payments against an index of GDP per capita and you’ll see we used to effectively boost payments at GDP/capita, much bigger than inflation. Then around 1981 that changed. Recipients are now relatively poorer by some 20% and their position in the income distribution ineluctably declines. The chained CPI is the new gambit to further impoverish the elderly. I get the whole substitution idea behind this, but my problem (conceptually) is, what if I’ve made it this far by doing that, and there’s little additional savings to be gained? Sure, beans and rice could be lost and cat food gained, but is there any gauge as to how many have already sacrificed over the last 20-30 years just to stay middle class? From what I see, ‘the elderly’ are a huge profit center. If you wanted to goose the economy, you’d increase the money going to the elderly. As earlier comments have noted, they need transportation, medical, and often assisted living care. They also benefit from wellness and fitness programs. You want more money flowing in the economy? Build up senior services, including fitness classes and senior center activities. As earlier commenters have noted, the $99 printer price is simply the gateway to get you to buy the print cartridges. HP has to make their money off the ink cartridges, not off the printer. As for lower computer costs, they are partly due to lower costs for hardware. But it is also a factor of the transition to mobiles and devices: to smaller, more mobile types of computing. In 2012, tablets and smartphones outshipped PCs. That was a tipping point. Tablets did not exist in 2009; however, in the past three years, Apple has sold over 100,000,000 iPads. That enormous figure doesn’t include Samsung or Win-based tablets. It also does not include Nooks, Kindles, Kobo’s, or other eReaders. Cutting social security is morally wrong and economically stupid. We need to lower the retirement age to 55 and increase social security so that it keeps up with inflation. For 40 years, productivity has increased while wages stagnated and capital investment has stolen middle class financial security. It is time to reverse this trend and for my money, any plutocrat that isn’t prepared to reign in his or her greed can take flight and don’t let the door hit you in the &^% on your way out the door. A couple years later and the fiscal cliff just keeps getting pushed farther down that road. Not to be crazy but I find that there is even more fallout from the problem with CPI and growth at various parts of the citizen level, the end level of the economy. I saw an article just yesterday that WalMart’s prospects over the next few years don’t look very good because real income has dropped over the last 10 or more years and the people that they rely on will not be able to even buy their cheap “government subsidized by policy” products anymore. What will happen then for the people that completely drop out of the economy?